A native of northern Russia, Alexander Baranov was a middle-aged merchant trader with no prior experience in the fur trade when, in 1790, he arrived in North America to assume command over Russia's highly profitable sea otter business. With the title of chief manager, he strengthened his leadership role after the formation of the Russian American Company in 1799. An adventuresome, dynamic, and charismatic leader, he proved to be something of a commercial genius in Alaska, making huge profits for company partners and shareholders in Irkutsk and St. Petersburg while receiving scandalously little support from the homeland. 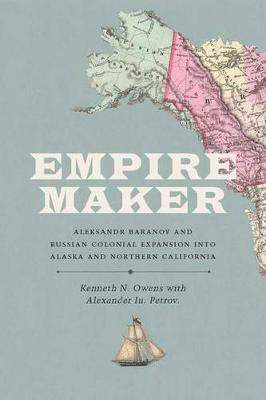 Baranov receives long overdue attention in Kenneth Owens's Empire Maker, the first scholarly biography of Russian America's virtual imperial viceroy. His eventful life included shipwrecks, battles with Native forces, clashes with rival traders and Russian Orthodox missionaries, and an enduring marriage to a Kodiak Alutiiq woman with whom he had two children. In the process, the book reveals maritime Alaska and northern California during the Baranov era as fascinating cultural borderlands, where Russian, English, Spanish, and New England Yankee traders and indigenous peoples formed complex commercial, political, and domestic relationships that continue to influence these regions today. This work is not merely the first comprehensive and well-researched biography of Baranov but also a valuable contribution to the multilayered and interdisciplinary study of Russian overseas colonialism. . . . The project is important not only for the academic community but also for politicians, the public, and the media on both sides of the Atlantic. [Aleksandr Baranov] has never been the subject of a full-length scholarly biography. Empire Maker. . . is a praiseworthy effort to remedy that oversight. . . . Owens has woven biographical facts gleaned from widely scattered sources into a cohesive narrative set in historical and cultural context. What will surely remain the definitive English-language study of Aleksandr Andreevich Baranov. . . . This deeply researched study is the rare book that historians of Russia and the North American frontier alike will read with great interest and benefit. [Empire Maker] transcends the limits of biography through some stellar archival work and by letting Baranov's story recede at key times behind the larger epic of Russian America. The authors have managed to give us both a very useful picture of life as a merchant in nineteenth-century Russia as well as a new, very accessible general history of the colony that nicely complements Lydia Black's and Ilya Vinkovetsky's recent works on the subject. . . . [An] excellent biography. This is an highly enjoyable book about a part of America that few people in America would even know about. The author does an excellent job of placing Mr. Baranov in his time and the events that would influence him. An excellent book about a man very people know about.